North of the Brooks Range, the land sweeps down and to the north to the shores of the Arctic Ocean. No trees interrupt the view across the barren miles of coastal plain and low, rolling hills. Wide, shallow rivers and their lesser tributaries meander north, depositing broad gravel bars. 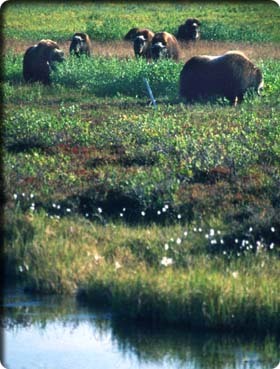 Wildlife including grizzlies, musk ox, arctic foxes, Porcupine caribou, and polar bears roam at will. Until very recently, travel to the region was enjoyed only by the well-funded. A few tourists visited Barrow for its northernness, while all others flew in for research, work, hunting, fishing, or major adventuresor because they lived on the slope. With the opening of the Dalton Highway to general traffic, access to the North Slope is now possible for any intrepid traveler with a good vehicle, a successful thumb, or a sturdy bike and no fear of flying gravel. Wildlife populations are sparse due to the challenging environment, though animals are easily spotted in the open terrain. The locations of herding musk ox and caribou are well known though only occasionally observable from the road. Grizzlies roam actively and can pop up anywhereincluding your free camp spot on the shoulder of a pipeline access road. Polar bears dont come too far inland, but are frequent summer visitors to areas of the coast. The BLM manages most of the eastern lands of the North Slope, much of it in the vast National Petroleum Reserve south of Barrow (which does not, by most accounts, reserve much oil). To the west, the slope narrows as the Brooks Range and Arctic Ocean converge. The Arctic National Wildlife Refuge (see above), administered by the U.S. Fish and Wildlife Service, encompasses all of this regionthough the Arctic Slope Native Corporation controls 92,000 acres around Kaktovik. The central area of the slope, including the Prudhoe Bay oilfields, is state-controlled land. All are similarly wild, though the scarring of tundra from overland vehicles, mineral extraction, and oil exploration is more prevalent west of ANWR.